Gina gains her Australian Champion Title, Penrith Kennel & Obedience Club, 2 July 2011. Gina wins RUNNER UP BEST EXHIBIT IN NON SPORTING GROUP, MAY 2011. 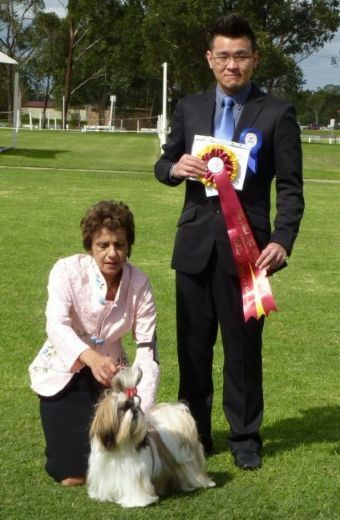 Gina wins BEST PUPPY IN SHOW, SHIH TZU CLUB OF NSW, APRIL 2011. Gina wins BEST BABY IN GROUP AT DOGS NSW SPRING FAIR NOVEMBER 2010. THIS LITTLE GIRL IS SURE TO FOLLOW MY BEAUTIFUL CAMEO. SHE HAS THE SAME ATTITUDE AND ALSO THE LOOKS TO DIE FOR. SHE IS ALSO A DAUGHTER OF MY NEW BLACK IMPORT CHRYS-HAEFEN MAN ON FIRE. Another well bred Placky Shih Tzu, Watch out for this little girl who has personality plus, Correct Tea Pot Tail, and good reach and drive.